In his topical new book, Ethical Borders, Bill Ong Hing asks, why do undocumented immigrants from Mexico continue to enter the United States and, what would discourage this surreptitious traffic? An expert on immigration law and policy, Hing examines the relationship between NAFTA, globalization, and undocumented migration, and he considers the policy options for controlling immigration. He develops an ethical rationale for opening up the U.S./Mexican border, as well as improving conditions in Mexico so that its citizens would have little incentive to migrate. In Ethical Borders Hing insists that reforming NAFTA is vital to ameliorating much of the poverty that drives undocumented immigration and he points to the European Union’s immigration and economic development policies as a model for North America. 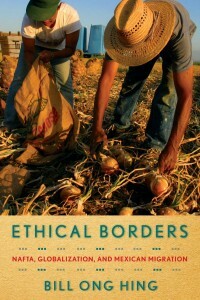 Hing considers the world-wide economic crisis and the social problems that attend labor migration into homogenous countries, arguing for a spectrum of changes, including stricter border enforcement and more effective barriers; a path to citizenship for undocumented migrants; or a guest worker program.